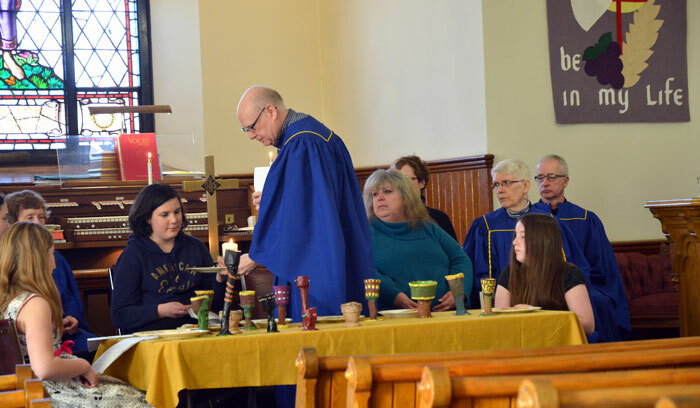 It was a wonderful, eye opening morning on Sunday, 20 March 2016 at Ashton United Church and Munster United Church. There were rumours that there would be a parade, that there would be an appearance by Jesus, and we were promised to have an intimate look at the disciples around the table as they share their last supper with Jesus. It all came true! In Munster the choir processed and Liz welcomed everyone and started the service. Then a bouncy young girl in pig tails bounded in to the sanctuary all excited. She was all hyped up over meeting Jesus and wanting to meet him because she wanted to change her life for the better. All heads and eyes followed her around the sanctuary as she shared her vision of what she expected from meeting Jesus and what she hoped she could change, all interspersed with sightings of Jesus approaching. The sightings mostly turned out to be false sightings. As this little girl moved energetically around the sanctuary, she sat down beside or behind a member of the congregation and shared her personal insight and expectations for a few moments then moved on. At times she seemed as though her energy was beyond her control and her enthusiasm spread to everyone watching and listening to her. Finally her wish came true as she spotted Jesus in the distance through her binoculars that previously hung around her neck. It was a parade with Jesus, disciples, and followers waving palm leaves. She urged everyone in the sanctuary to start waving their palm leaves with her and everyone joined her with great enthusiasm. Having seen Jesus approaching and knowing there was a chance she could meet him, she headed off toward the parade. A short time after she left for the parade, the choir performed it’s anthem and the first scripture reading was given. Surprisingly, there was an appearance by Jesus and all the disciples. Volunteer members of the congregation, including willing participants from the Youth Group and Sunday School gathered to be part of the dramatic presentation. As in Biblical times and locations, they were in bare feet which added to the impact on those viewing. The setting was the last supper. The disciples assembled, then Jesus entered and joined them. The disciples asked questions with some being answered clearly and others with a puzzling answer. Jesus washed the feet of Peter and gave the word that one amongst them would betray him. The piece of bread indicative of the betrayal was given to Judas. Jesus also gave some clues to what was to come and the impact on some disciples. From the dramatic presentation, members of the congregation received greater insight into what the disciples were thinking, some of the questions they had and asked, some of the things they still did not understand, and what they didn’t know was to follow. Our thanks go to Rev. Karen for planning this and researching the presentation, as well as starting the service off with a great boost as the young, excited girl. Thanks goes to Liz Hale for arranging twelve volunteers to play the part of the disciples and Jesus and for ensuring each person was prepared for what they were to say and do. Thank you too to the willing participants of the presentation. The service was a very good eye opener for our Lenten journey and one well received. Below are two images fromt he presentation at Munster United Church. A similar scene was seen in Ashton United Church. Volunteers in Munster during the dramatic presentation on Palm Sunday, 20 March 2016.